role of storytelling in architecture. 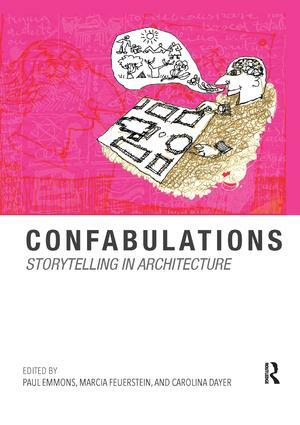 Confabulations is an insightful investigation into architectural narratives. Paul Emmons is a registered architect and professor at the Washington-Alexandria Architecture Center of Virginia Tech where he directs the PhD program in Architecture + Design Research. Marcia Feuerstein is an architect and associate professor at the Washington Alexandria Architecture Center of Virginia Tech. Her research investigates links between theory, practice, and performance in architecture. Carolina Dayer is an architect in her native country Argentina and recently received her PhD degree from Washington Alexandria Architecture Center of Virginia Tech. She currently teaches at Aarhus School of Architecture in Denmark. Her research and personal practice focuses on multivalent forms of architectural drawing.